Today I was given a new Strange Ingredient and I couldn’t be more excited to play with … curry leaves. I’ve never worked with them before so I’m forging new ground here. First step was to Google curry leaves. Fascinating to find out that they have nothing to do with the ground curry we all know and love. I certainly made the assumption there was a connection, but you know what happens when you assume…. My first whiff of the curry leaves was powerfully perplexing. Almost unsettling. I read that you might catch a faint hint of tangerine if lucky, but I’d say the aroma is more earthy, smoky and maybe even a more like burnt rubber. Appealing, I know. At first bite of the lentils, I almost detected a sweet, brown sugar flavor which is definitely not on my ingredient list. Then the flavors bursted, and I still can’t quite define it; it’s a totally funky flavor. The dish is hearty, yet light, spicy and delicious! After serving a little dish for each of us, I set aside my cup and pulled the whole serving dish in front of me and polished off the remaining lentils. I was hooked. There are mixed reviews on whether to eat or not eat the curry leaves; I’ve read they have medicinal properties and are good for the eyes. 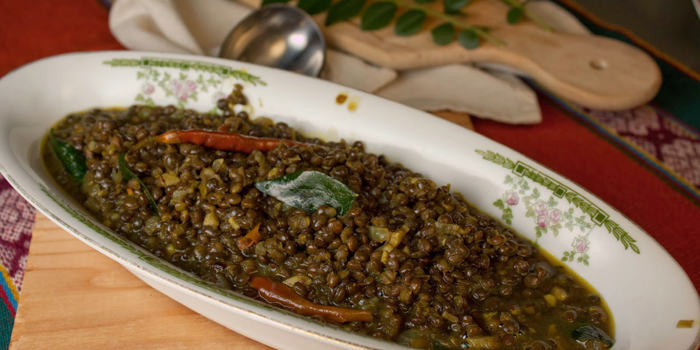 Either way, go find some curry leaves today then make this utterly flavorful and so delicious Fat and Happy Spicy Lentil dish! Bring the broth to a hard simmer, add the lentils, turmeric and peppers. Reduce the heat to a light simmer, cover and cook about 15 minutes. Remove the cover and let any extra liquid boil down while you fry the curry leaves. In a medium-size fry pan, melt the coconut oil. Add in the onion and fry until the edges just a begin to brown (a handful of minutes). Add in the garlic and salt. Continue to cook a minute. Add in the curry leaves. For extra spice, chop one of the peppers from the lentils and add to the pan. Fry another few minutes then pour the curry leaf mixture directly into the lentils. Fat and Happy Food Blog Tips and Techniques: There is no substitute for curry leaves. 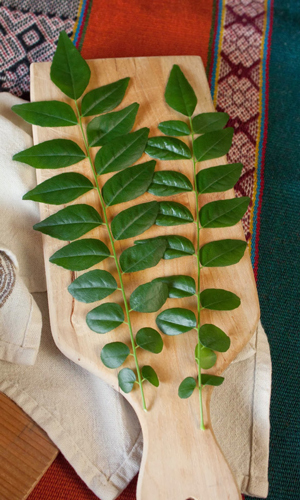 Look in Indian or Asian stores for fresh curry leaves. You can also find them online but I hear the shipping charges are more than the leaves themselves. Store the leaves in the refrigerator for up to a week or freeze them.